Made America Proud! 17-year-old young Snowboarder Red Gerard has won the first gold medal for Team USA in the 2018 Winter Olympics in PyeongChang, South Korea. Gerard, who was initially in the last place before he went into his final run, exterminated his opponents on Saturday, February 10, pulling out some unique moves that resulted in a score of 87.16 from the judges. 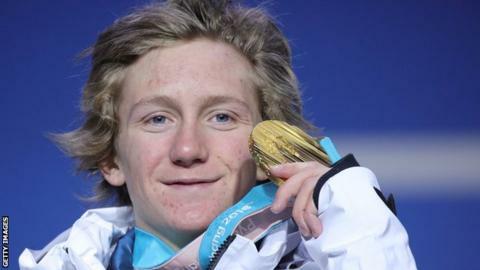 He has become the youngest American ever to win a medal in snowboarding. Wow watching Red Gerard go from 11th place to winning the gold gave me chills! The athlete, who has been playing with snowboard since the age of 2, spoke with media ahead of the Olympics about his plans with his parents and six siblings should he win a medal. I can just maybe go out with them and have a nice dinner — nice and easy. But according to the Olympian, his family had decided to celebrate the win in a different way. I’m pretty sure I saw a video of them shotgunning beers at 8:30 a.m. So I’m pretty sure they are doing just fine.